Trinice McNally sits in her office at the University of the District of Columbia (UDC) surrounded by boxes of papers and bags full of empowerment swag-buttons with “undocumented, unafraid and unapologetic” in bold, printed graphics. These items share their space with a herd of elephant figurines standing as silent symbols of her sorority, Delta Sigma Theta. 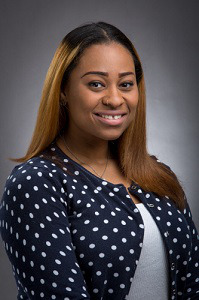 The 29-year-old is still settling into her role that she began in January as the founding director of multicultural affairs for UDC’s all-new Center for Diversity, Inclusion & Multicultural Affairs, which is set to have a grand opening at the end of 2018. For now she’s a one-woman band. She’s working with the university to hire staff for the center. Through the center McNally says she will address what she believes to be some of the most urgent issues in higher education: promoting inclusion for LGBTQ people and other historically marginalized communities. This includes Dreamers, both documented and undocumented students and first-generation students, specifically first-generation immigrants, she says. UDC is intentional about accepting undocumented students, a move that she says other historically Black colleges and universities (HBCUs) have been reluctant to do. Thirteen percent of UDC’s students are international, hailing from more than 82 countries. “You’ve seen 45 [U.S. President Donald J. Trump] make very clear attempts to dismantle the experience of immigrant folks,” she says. A huge part of the center’s work is to spark conversations with and provide resources for international students, no matter their status, she says. “Folks deserve to have equality, access and justice in the same ways that folks with American citizenship or residence have,” McNally says. She has an especially vested interest in promoting LGBTQ rights and inclusion at UDC and other HBCUs. Besides the Black church, she notes that HBCUs are the oldest institutions for Black people, so it makes sense to start there when it comes to pushing for changes. McNally has an extensive background in working with HBCUs. Before joining UDC, she was the program manager for an HBCU equality initiative at the National Black Justice Coalition, one of the largest LGBTQ civil rights organizations. Like that role, her new position marries two of her interests: LGBTQ issues and HBCUs. Her commitment to those interests grew out of her own experiences as a Black lesbian and queer person at Bethune Cookman College, where she earned a Bachelor of Science in psychology and Master of Science in transformative leadership. McNally says that the culture wasn’t inclusive of LGBTQ individuals in terms of policy, climate and resources. It was in college when McNally decided to come out to her family; she did it by simply bringing her girlfriend home from school to meet them. As a child being raised by her grandparents, she was never made to feel that being gay was wrong, she says. But at the same time, she felt isolated by her family for many years after revealing to them that she was a lesbian, McNally says. Her position at UDC’s new center will allow her to lead conversations and help to level the playing field for not only LGBTQ students, but also for students facing immigration issues. McNally says she approaches all issues of diversity and inclusion from the perspective of Black queer feminists. Joining the Black queer feminist organization Black Youth Project 100 a few years ago was the precipice for her decision to adjust the way she perceives and the way she works to solve problems related to diversity and inclusion. McNally says that she will continue her advocacy work of trying to create justice and equality for all people, especially marginalized people attending HBCUs. “Utilizing this tool allows me to center LGBTQ students, international students, undocumented students and first generation students in a holistic way,” she adds. This article will appear in the October 18, 2018 edition of Diverse.